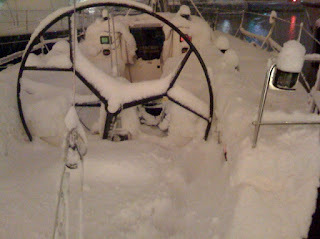 Unexpectedly HUGE dump of snow in London last night, as you can see from this picture of our boat at St Katherine Docks. London, with 12 million people usually has something of a micro climate keeping it warmer than the surrounding towns and cities. Also, down at water level (it is still tidal at this part of east London) the Thames usually keeps things a bit warmer too, like a giant storage heater, so this much snow on the boat is very unusual. It's actually really hard to get on and off the boat safely as you can imagine - although it was very snug on board last night. Ice and snow on gel coat, even with a textured non slip racing-safe finish, is quite a lively surface underfoot! This is a great photo Stephen - what strange weather! My mun, who live sin Dorset (next tot he national Sailing Academy - so you can get your bearings!) had more snow than me in East Lothian, Scotland. Also did a great little Twitter exercise today with a class to get weather information from other twitters around the UK. I think you will like it and I'll get around to writing about it later in the week. Take care. OB.